"In Vrindavana all the pure devotees pray for the mercy of Srimati Radharani, the pleasure potency of Lord Krishna. 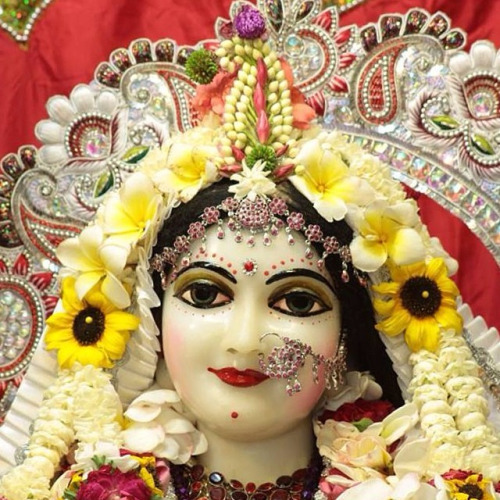 Srimati Radharani is a tenderhearted feminine counterpart of the supreme whole, resembling the perfectional stage of the worldly feminine nature. Therefore, the mercy of Radharani is available very readily to the sincere devotees, and once She recommends such a devotee to Lord Krishna, the Lord at once accepts the devotee's admittance into His association. The conclusion is, therefore, that one should be more serious about seeking the mercy of the devotee than that of the Lord directly, and by one's doing so (by the good will of the devotee) the natural attraction for the service of the Lord will be revived."